Harry Warren Wilson designed the St Clement’s building panel which has overlooked Portugal Street since the 1960’s. Sue Donnelly, LSE Archivist, uncovers the controversy surrounding its creation. In 1959 the School began work on the refurbishment of the St Clement’s Press building overlooking Clare Market, now known as the St Clement’s building. As part of the work the School commissioned the artist Harry Warren Wilson to design engraved glass doors for the main entrance and a decorative panel for the corner of Portugal Street and Clare Market. Harry Warren Wilson had trained at Cambridge School of Art and the Royal College of Art and was Director of the Division of Decoration at UCL for twenty years and artistic adviser to the Department of Overseas Trade. Wilson was known as a stained and engraved glass artist who had worked at the Royal College of Surgeons and St Clement Danes. He had previously produced a set of carved wooden portrait roundels for the special reading room of the Library. The design of the artworks was overseen by a sub-committee of the St Clement’s Building Committee. The sub-committee’s initial preference was for the School coat of arms, St Clement’s anchor or portrait heads of the School’s founders Sidney and Beatrice Webb. In January 1960 Wilson presented an initial model of the panel to the sub-committee which suggested incorporating portrait heads of the Webbs into the design. In March the sub-committee accepted a design close to the finished work but wanted to include St Clement Danes. The final version unveiled in July 1961 included neither the Webbs nor St Clement Danes. There was no opening ceremony for the building but the press notes describe the work as a panel of vitreous mosaic 38 feet high and seven feet six inches high. The subject was the Thames conventionally represented from the docks to Battersea with several of its bridges. The aluminium frets standing proud of the mosaic indicate fields of study at the School – an eighteenth century clipper ship represents commerce, a plane – transport, the façade of the Royal Exchange – finance, law is represented by the figure of justice from the Old Bailey and government by the Palace of Westminster. At the bottom Battersea Power Station stands for industry. The panel did not prove popular. One alumnus described the design as “tinny” and “reminiscent of Battersea funfair” and on 15 November 1961 Academic Board presented a motion for the removal of the new decorative scheme supported by both Kenneth Minogue and Ralph Milliband. LSE’s Director, Sydney Caine, expressed himself disappointed in the design but felt it was unlikely to be removed as this would cause difficulties with the University Grants Committee and the University of London who had funded the refurbishment. On 29 November Academic Board passed a motion expressing dissatisfaction with the design and in March 1962 the Building Committee agreed to discuss the removal of the panel. The dispute even made it into The Observer on 22 July which reported that students had started an anti-Ugly movement. 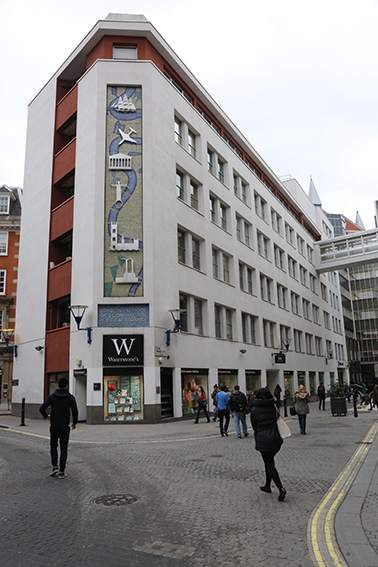 Harry Warren Wilson’s mural on LSE St Clement’s building on the corner of Portugal Street and Clare Market. In November 1962 an architect reported that the cost of removing the panel and replacing it with windows would cost £1,000. The original design had cost £850 and the cost of change was too high – so the panel survived to become part of the LSE landscape. I liked your piece about the vertical panel on the corner of the St Clement`s Building. I clearly remember the Academic Board meeting at which members expressed dismay. Nobody spoke in its support. A decisive intervention was by the late Professor Lionel Robbins (later Lord Robbins, and Chairman of the Court of Governors). He said “the mind boggles”, and that if it had to stay in place this should be on condition that it was never cleaned. I don`t recall whether it was the poor design that caused his mind`s boggling, or the judgment of those who had approved the design. Robbins`s brief comments were met with universal murmurs of approbation and effectively concluded the discussion of the matter. I do not know whether the “no clean” request is still being observed: it certainly was for some years.